The Leyton Orient Trust, linked to Leyton Orient Football Club in East London, aims to make a positive impact on the lives of disadvantaged Londoners through sports, education and leisure projects. The Trust has over 25 years experience of managing projects funded through a number of sources, including government and public health grants. The project provides cycle confidence and maintenance training to families with pupils still in primary schools. Participants are identified through the Trust’s relationship with local schools, the Leyton Orient Trust School Sport Programme and other community organisations. The Trust’s connection with the football club is also used to encourage attendance. The project has attracted a wide demographic of participants of different religions, cultures and nationalities, and enabled people of different generations to learn and develop together. “There is a really wide demographic taking part in the project, and a wide age range, and everybody gets along really well” – Instructor. The project delivers a five week programme to participants. The first two weeks consist of basic cycle training, in a safe outdoor space. This is then followed by a maintenance session in the third week, teaching basic repair and upkeep skills. Led rides in the local area are held in the final two weeks, on ‘offroad’ cycling infrastructure, such as bike lanes, canal towpaths and paths around the Hackney and Walthamstow marshes. All sessions are led by a qualified instructor, who is assisted by a volunteer from the Score Centre by Leyton Orient Football Ground, from which the project is being run. Bikes are also available for participants who do not currently own a bike, enabling as many people as possible to take part in the sessions. “We received fantastic feedback from participants from the first group and also held our first matchday ride to promote active travel, which was a big success” - Project Leader. The Trust aims to ensure sustainability of the project by securing training for volunteers to lead rides and eventually pass instructor training. 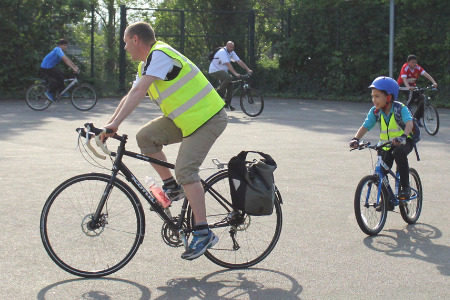 By providing the training to families, it will provide participants with the confidence to cycle in groups for leisure or individually for transport. To find out more about Leyton Orient Trust, please visit their website, or follow them on Twitter.